Ederki has a range of amazing products to season your culinary preparations. Try our seasonings now available for on-line sales: AOP Espelette pepper, AOP, Espelette pepper jelly, strong purée, salsa for barbecue and plancha and many other Basque condiments. Explore the characteristic tastes of Basque cocktail offerings. Ederki proposes a range of delicious products on its on-line sales site: tapas, olives, stuffed del piquillo peppers and many other specialties, delivered to you within 48 hours! Ederki proposes an entire range of Basque country specialties, all prepared and ready-to-go, delivered within 48 hours at your address. In this range you will also find side dishes and vegetables, to serve magnificent meals that are 100% Basque! Discover the sweet treats from the Basque country: Basque cakes under the Eguzkia label, artisan black-cherry jam, and selected products from Southwest France chosen for their outstanding quality. All the emblematic spirits from the Basque country, now available for sale on line! The organic line of products from Ederki offers you their most famous products such as Ederki piperade, Basque sauce and Gazpacho. 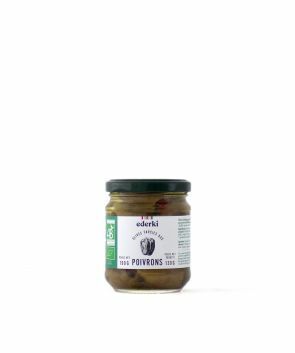 Also discover the new Ederki recipes with new pâtés (south-west and Armagnac), vegetables, and stuffed olives. Jean Vier is a leading brand of Basque fabrics in the very heart of the Basque country for over thirty years. You will find a Basque presence to enhance your interior decoration, with their matchless stripes that correspond to the seven provinces in the Basque Country. Ederki’s organic product range offers the opportunity to try outstanding Basque specialties. .
What to make with our products ? The entire team at EDERKI welcomes you to its site for on-line purchasing of Basque country products! Ederki was founded in 1942 in the very heart of the Basque Country. Ederki sells delicious Basque gastronomy products made with top-quality ingredients. Discover the Basque country lifestyle by serving and enjoying culinary specialties that provide you with everything you need, from cocktail time to dessert. Try our tapas, our pâtés, our del piquillo peppers and our Basque spirits … just a few examples of what we do! Ederki products are made in compliance with strict criteria. Our meats come from south-west France, our vegetables from France and Navarre, our prepared dishes are made with no preservatives and no additives, our Basque cakes are certified Eguzkia label and our jams are made with cane sugar. Ederki goes even further, with recipes made with 100% vegetables from France and a wide range of organic products.